Regatta Manager Assistant (RMA) is designed to help simplify the "on the water" requirements of running a sailing race. Club level novices to veteran certified Principal Race Officers will find it an indispensable tool that eliminates errors and simplifies procedures. It allows you to keep your eyes on the starting line and race course instead of the clock. More specifically, RMA automatically sounds the event horn as required by the chosen starting sequence. It can also optionally record each boat's finish. This is all accomplished by integrating hardware and software into an easy to use robust system. 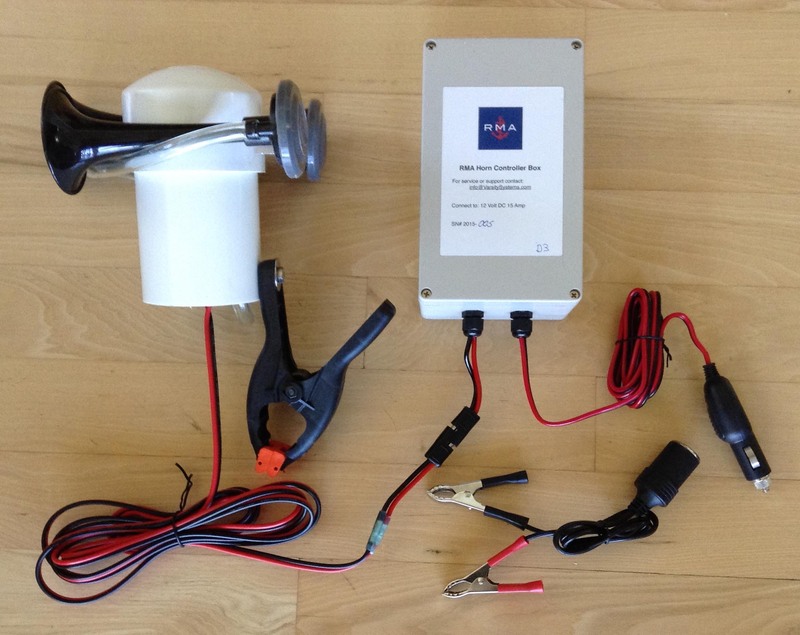 The hardware consists of a 12 volt, 120 decibel air horn connected to our special controller box (RMA Horn). The software runs on your own iOS device (iPhone®, iPad®, iPod Touch®) and communicates wirelessly with the controller box to sound the horn as required. The user interface is intuitive and informative. Just select the desired starting sequence, enter the number of starts for the race and tap "Begin". A digital countdown timer is continuously displayed along with prompts indicating which visual signals need to be raised or lowered and when. This is supplemented with an audible 10, 5, 4, 3, 2, 1 countdown so you won't miss a signal. 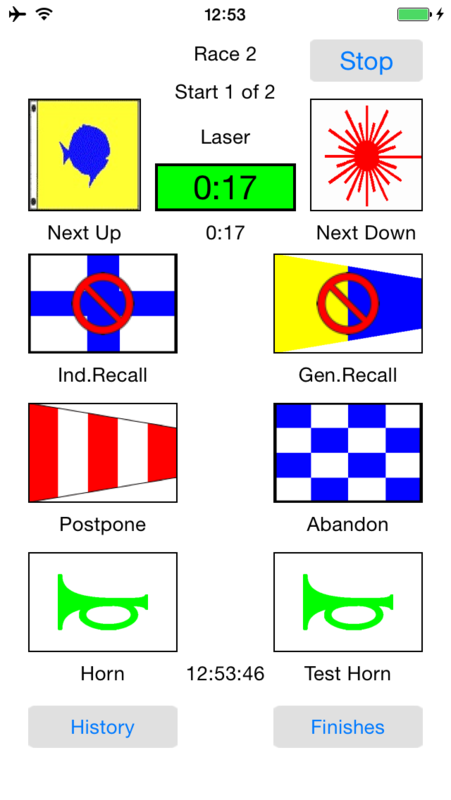 Individual recall, general recall, postpone, abandon and resumption of racing are supported by simply tapping the appropriate button. The App minimizes errors by automatically activating options at the appropriate moment. To record finishes, before the race, enter the participating sail numbers, or import them from an emailed text file. As each boat finishes, you can type their sail number or double tap on a list of the entries. Finishing place and elapse times are automatically calculated. A text file with the results can be emailed to the official scorer directly from your iOS device. Three built-in starting sequences (Rule 26, Appendix C3.1 and Appendix S) are included but custom sequences can easily be added by installing simple configuration files. You can create these files yourself or contact us and we will do it for you. We can email the file directly to your iOS device where it is easily installed. You can use the App without the RMA Horn by simply setting a preference to bypass this option. In this case, sounds will be made through your device's speaker. It is not loud enough for the competitors but will prompt the race manager. RMA is available on the Apple iOS App Store. Simply search for 'Regatta Manager'. RMA Horn includes 120 decibel 12 volt DC compressor driven dual trumpet horn, weather cover (for compressor), mounting clamp, water resistant controller box with cigarette lighter style connector or alligator clamps. Please note that we currently have a limited number of RMA Horns available. This App is not designed to generate event results/scoring reports. Apple, iPhone, iPad, iPod Touch are trademarks of Apple Inc., registered in the U.S. and other countries.